With school back in session and darker mornings ahead, Metro Transit wants pedestrians to take extra caution as they travel in our bustling urban areas. 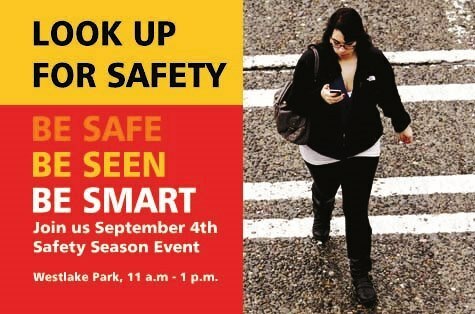 Come join us Wednesday, Sept. 4, at Westlake Park in Downtown Seattle as we launch the Safety Season, promoting pedestrian safety. The event is planned 11 a.m. to 1 p.m., where local groups will share key points of pedestrian safety. Metro, the City of Seattle, Sound Transit, Cascade Bicycle Club and Feet First will be there, with a guest appearance by the Mariner Moose. Speakers at the kickoff event include King County Executive Dow Constantine, state Traffic Safety Commission Executive Director Darrin Grondel, Metro Transit operator Theresa Tobin and Metro Transit Safety Superintendent Darryl Russell.